Creating Wedding hair with beautiful brides has to be one of the best and fulfilling parts of being a mobile hairdresser. Over the years I have helped many Dorset and Hampshire Brides get ready for their big day, as well as their Bridesmaid, flower girls and other Wedding guests. Choosing a wedding hairdresser can be a daunting prospect, especially as sometimes it may not be possible to use a salon that you would usually use for your everyday hair. Even if you have not used my mobile hairdressing services in the past, you can have the piece of mind that when booking with me that beforehand I offer I complimentary free trial – just to make sure you are happy with your hairstyle and that we get it exactly how you want it. When choosing a wedding hairstyle it may be useful to bring pictures and ideas of what style you would like on your wedding day. I have had previous brides just want a simple beautiful blow dry to others wanting a more extravagant hairstyles. With my experience I can help you achieve the perfect style for your perfect day. Every girl wants to feel special on their wedding day and more importantly they want to look and feel great too. I offer all my brides-to-be a consultation and trial before their big day to make sure they are happy with their chosen style. If you’re stuck for how to style your hair on your wedding day, have a look at the photos on this page or take a look at my wedding hair inspiration gallery or during your trial we can go through a few styles to help you find the perfect look. When you come along to your hair trial, bring along anything that will help me get to know your individual style. Photos from magazines, pictures of you in your dress, ideas about make-up. The more inspiration you bring along the better idea of your style I will get. Try not to wash your hair on the morning of your wedding. Your hair will be in better condition once it has had time to relax and this will help keep your hairstyle in place on your wedding day for longer; especially if you have chosen an up-do. On your trial and more importantly on your wedding day, make sure that your hair is product free to achieve hair that will last on the day. Talk to me about any accessories that you may want to put in your hair on your wedding day. It will help me create a style that can be adapted to fit your accessories. If possible it is best to have your hair trial at least 4 months in advance. This will help me to guide you if necessary on how to grow your hair into you desired style. To make sure your hair is in top notch condition, it is essential that you have regular cuts to help improve the condition, manageability and the ability to style it on your big day. Try to find a style that reflects YOU. 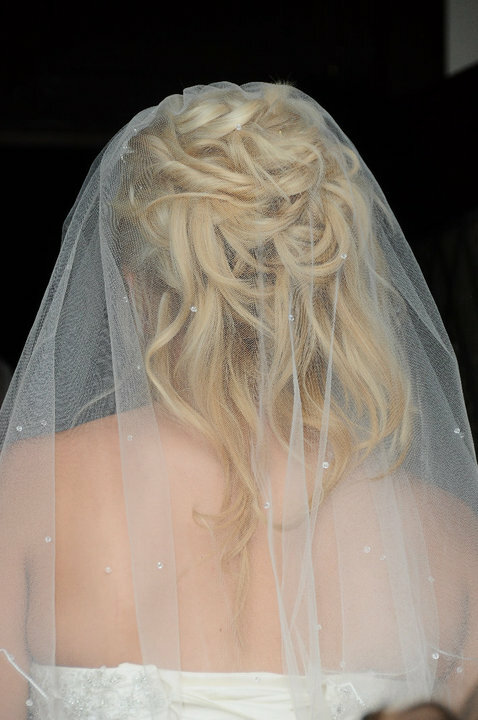 If you usually wear your hair long and wavy then a sleek back look isn’t really going to show you on your wedding day. Wearing a style that suits you and that you feel comfortable with is vital in order to achieve the perfect look. If you colour your hair you should do this again at around two weeks before your wedding day in order to hide any regrowth. You never know what’s going to happen on your big day, so with all my trials I show my brides-t0-be a variation of different styles that can be altered to whatever suits the weather conditions on the day. It is important that your hair is in the best possible condition for your wedding day. You want your hair to look healthy and shiny, you can consult with myself for any hair product recommendations.